Low water pressure problems? | Robins Plumbing, Inc.
Are you experiencing low water pressure in your home? If you’re experiencing low water pressure in your home, it may not be necessary to call Robins Plumbing to diagnose it. Let’s go over some of the main reasons for low water pressure and see if we can help you fix this issue on your own. Are you experiencing low water pressure in your whole home or at just one faucet? If you’re having trouble with only one faucet there is usually one of four issues creating the problem. Three of these issues you can likely address on your own. The volume is being restricted by angle stops that are not on all the way. Angle stops are the shut-off valves underneath your sink. There is an angle stop for both hot and cold. You will want to make sure that both angle stops are turned on all of the way. A supply line is kinked underneath the sink reducing volume. There are supply lines that connect your angle stops to your faucet, a slight kink in these can reduce volume and by doing so reduces pressure. Make sure that these supply lines have no kinks in them. Another common cause for reduced pressure at your faucet or from your shower valve is debris caught in the fixture. At the end of your faucet is a small end cap with what looks like a screen, that is called your aerator. Your showerhead and aerator can often get a buildup of hard water in them that can restrict the flow of water. Your aerator should unscrew easily from the end of your faucet. You do NOT want to remove this with just pliers or anything hard metal as you will scratch the surface of your aerator and faucet. If you don’t own a set of pliers with rubber ends a great tip to remove these is by putting a bunch of rubber bands around the aerator, the best rubber band for this is the thick ones you find around broccoli at the grocery store. Once your aerator is removed simply clean the screen gently with CLR, per the CLR instructions and screw it back on to your faucet taking care not to overtighten. 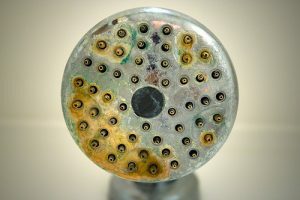 If the problem is at your shower you can remove your shower head and check it for debris or hard water build-up. Your shower head removes from the shower neck and like your faucet, do not use metal to metal to remove your showerhead, the rubber band trick works here too. Here is a word of caution to my DIY’ers, many homeowners and handymen end up breaking the shower neck in the wall attempting to remove a showerhead if you feel any resistance or wiggle in the shower neck my professional advice is not to touch it. A plumber’s tip if you want to attempt this on your own – use one wrench to hold the shower neck still while using another wrench to unscrew the shower head. By holding the shower neck in place and protecting it from twisting you have less risk of breaking the shower neck behind the wall, which can be an expensive repair often requiring the opening of the shower surround to fix. The last common issue of low pressure at a single faucet or shower is that the shower valve or faucet need to be rebuilt. If the other home remedies I recommended didn’t fix your issue it is time to call the pros at Robins Plumbing to come out and diagnose and repair the issue, whether it is a faucet or shower valve repair or an issue with the water line itself, we can get it fixed for you right away. Are you experiencing low water pressure to your whole house? The main shut off valve is partially closed or is broken. There is a main shut off valve for your entire house, it is usually located at the front of your house where your hose connects. Below that hose bibb is a valve that either has a lever handle on it or a circular handle. If you have a lever style shut off valve, this is known as a ball valve. You will want to make sure this valve is all the way on, it only turns 90 degrees, so this shouldn’t take too much effort, the handle should be parallel with the pipe if it is in the on position. If you have a valve with a circular handle, it is known as a gate valve. Gate valves are notorious for failing over time. If you find that the gate valve handle just turns and turns it is likely that the gate inside the valve has become disconnected from the threads in the handle that lower and lift the gate and your valve will need to be replaced. Do you have a pressure regulator? Not every home in the Phoenix area has a pressure regulator but many do, and your low-pressure problem could be a simple setting on the pressure regulator or that the pressure regulator needs to be repaired or replaced. Let’s start by prefacing, to test your pressure you’re going to have to go buy a pressure gauge. As silly as this is to me, pressure regulators do not have gauges built into them. Get a baseline reading of your pressure before making any adjustments to see where you are at, you will need to place your new pressure gauge on the hose bibb to test the pressure. Screw the pressure gauge on to the hose bibb and then turn the hose bibb on. Good pressure is a personal preference between 60-80 psi. You do not want to set your pressure higher than 80 psi because excess pressure can put excess strain on your plumbing system. If you need to adjust the pressure regulator, there is a bolt on the side of the pressure regulator, this is called your set screw. Turn the screw left or right to adjust your pressure. Close the hose bibb you have your gauge on and then disconnect the gauge. Turn the hose bibb on for 2-3 seconds and then turn it back off. Attach the gauge to the hose bibb again, turn it on and check your pressure, repeat this process until your house has the pressure you desire. Every time you adjust the set screw you will need to remove the gauge and turn on the hose bibb to get an accurate reading, don’t skip this step. The gauge will not adjust unless you run water to reset the pressure. 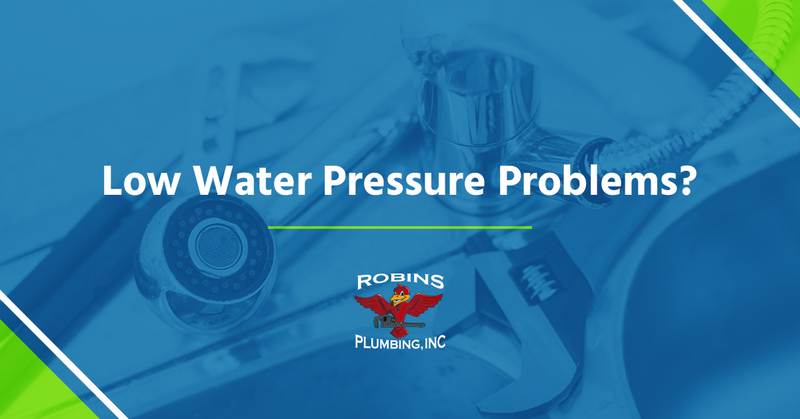 If the pressure won’t adjust, it is time to call the pros at Robins Plumbing! Do you have a salt water softening system? If you do have a salt water softener it could be that your saltwater softening system has malfunctioned and has filled your domestic water system with the brine material from its tank. There is no simple solution to this problem. If you find yourself in this situation the best advice, I can give you is to quit turning on plumbing fixtures in your home and call us right away. The more plumbing fixtures you use, the more of your system you will contaminate with debris. What does it look like when a salt water softener goes? Check out our blog here to see! Your water lines need to be replaced. This isn’t usually the cause of low water pressure, but it can be. Many homes in the Phoenix area have galvanized water lines and over time the inside diameter of your water lines decreases dramatically due to rusting and electrolysis. Galvanized pipe is made from steel, steel, and water mixed together over long periods of time, water will always win. The galvanized coating is supposed to prevent the steel from rusting but the coating can be damaged allowing the steel to be exposed and water to eat away at the steel.